I’m a huge fan of John Cassavetes, both as a director and as an actor, but unfortunately most of the films he directed were extremely hard to find until Criterion released their fantastic box set a few years ago. Now it’s even easier to see the five movies from that set — the Criterion releases have been made available via Netflix streaming. 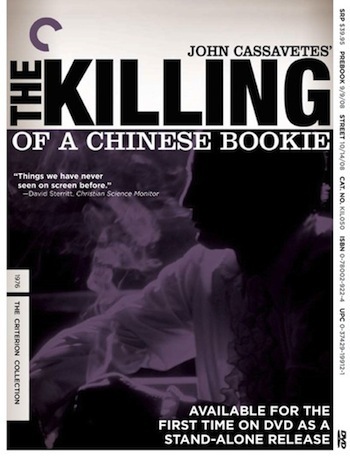 They’re all great movies, but my favorites out of that bunch are The Killing of a Chinese Bookie (which has been described as a metaphor for Cassavetes’ experiences in dealing with Hollywood) and A Woman Under the Influence, which features amazing performances from Gena Rowlands (Mrs. Cassavetes) and Peter Falk. I only wish the Cassavetes documentary A Constant Forge were available on streaming — it’s a must-see. If you’re a Russ Meyer fan, you’ll be able to spot Haji (Faster Pussycat! Kill! Kill!) in the trailer below (it might be a little NSFW, by the way).